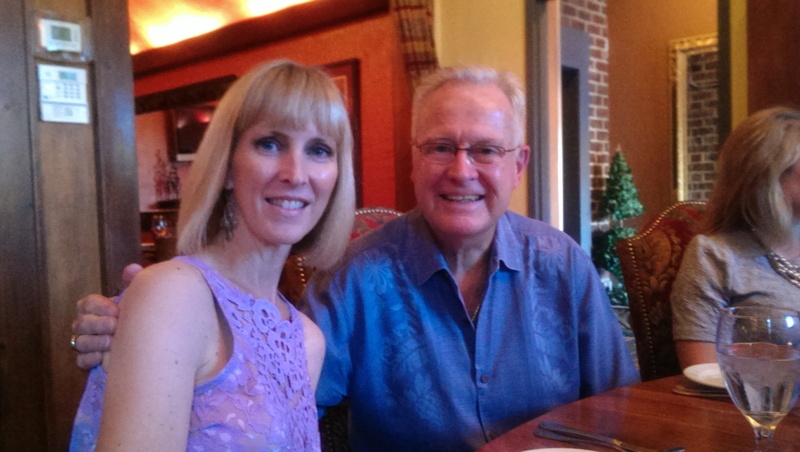 My dad turns 74 this week, and Labor Day weekend seemed to be the best time to gather the family and celebrate. Dad chose the restaurant, Benvenuti’s Ristorante, because he and my stepmom, Heather, had been there a few years ago and had good memories of their experience there. Conor, taking a break from college, and sitting next to Heather’s brother, Ryan. Our family is kind of spread out now, with two kids off at college, and although we couldn’t exactly grab my eldest daughter from Arizona, it was an option for my son, Conor, who’s attending the University of Oklahoma. 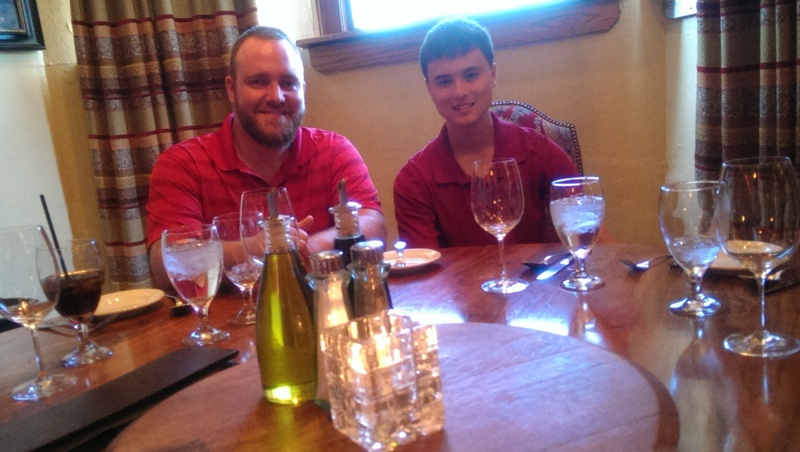 We were seated at a large, round table tucked in a corner of the restaurant, which was perfect for our large group. Dad (birthday boy) with my stepmom, Heather, and her mom, Becky. The restaurant wasn’t too busy, but it was quickly apparent that the staff was comprised of a skeleton crew for the holiday weekend. Either that, or they kept forgetting about our table since we were in a quiet, back corner of the restaurant. 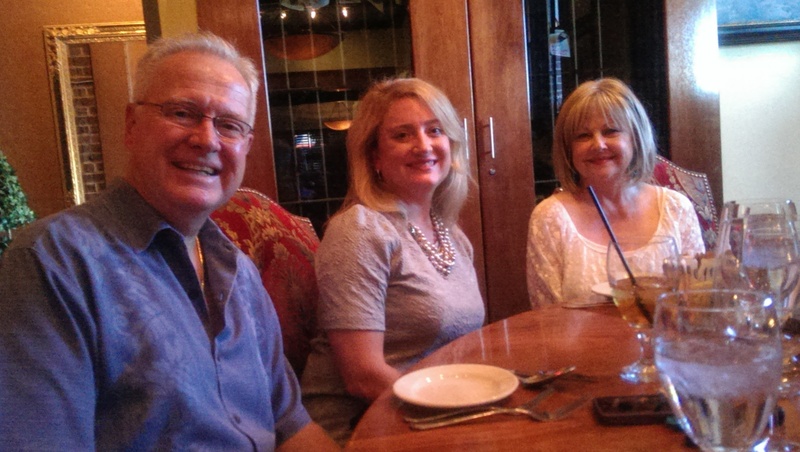 But, we weren’t in a rush and enjoyed having the time to catch up while celebrating Dad and his upcoming birthday. Lasagna al Forno with organic spinach and local mushrooms. Chitarra e Polpette – chitarra pasta with meatballs made from veal, pork and beef, in marinara sauce. 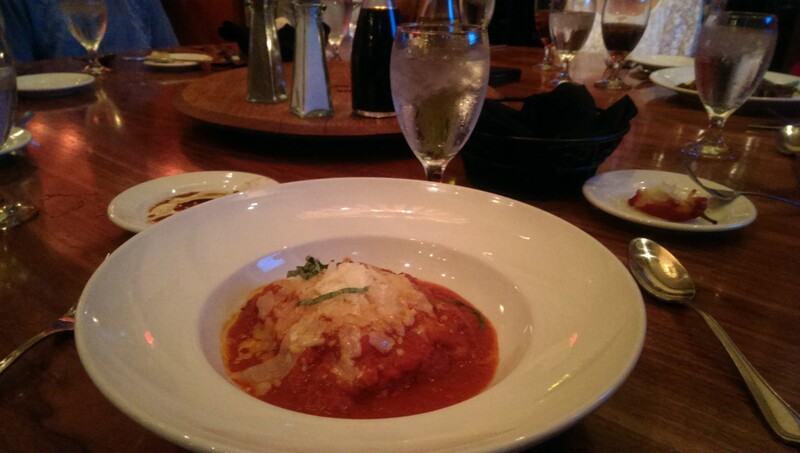 Jon ordered the lasagna, which was so hearty that he actually didn’t finish it. 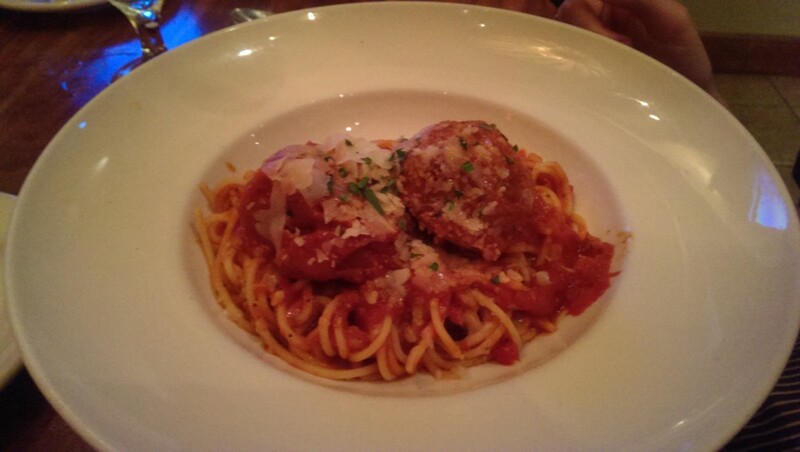 My youngest daughter, Lara, had Benvenuti’s version of spaghetti and meatballs, and like Jon, she couldn’t finish her plate either, but she said it was very good. She did fill up on warm bread with vinegar and oil beforehand. Jon with my youngest daughter, Lara. Love this pic of them! 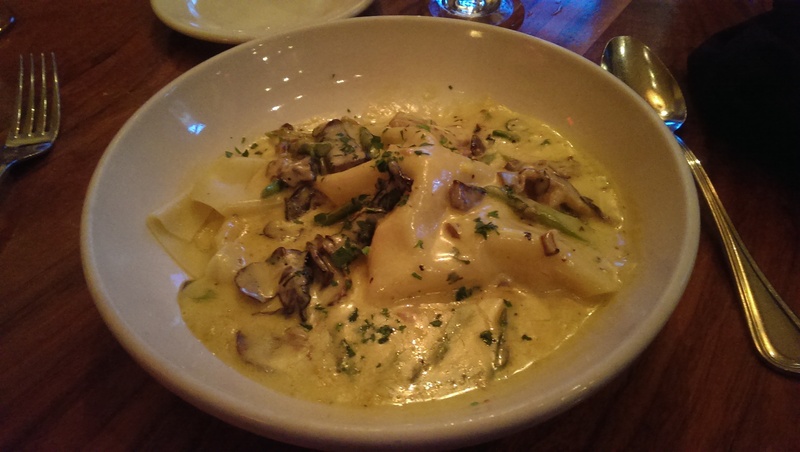 Lobster ravioli with asparagus and local mushrooms, with brandy, saffron and cream. Some of us had also started out with salads, so by the time our entrees arrived, we were wishing we hadn’t filled up so much on bread as well. But, again, the service was slow, and, well, we’re typically a hungry crowd. I chose the lobster ravioli, and it was actually my second choice. I’d visited the website beforehand and spotted an awesome-looking salmon dish called Salmon Picante, which was a chili-garlic rubbed wild king salmon served with couscous, artichoke hearts, tomatoes and purple onions. However, the waiter apologized that the website hadn’t been updated since June, and that entree was no longer offered. The lobster ravioli sounded good as well, and I was told that it was previously up for winning a city-wide best entree contest. It was really good, although the cream sauce was on the extreme rich side, and there was no way I could finish the whole dish. Besides, being the dessert foodies that we are, I had to save at least some room…. Triple chocolate dessert with almond brittle. The dessert menu was lengthy, and at the very top was a chocolate dessert. I can’t remember the name of it – all I know is that when I heard our waiter say the words “triple chocolate” in his description, that was all I needed to know. 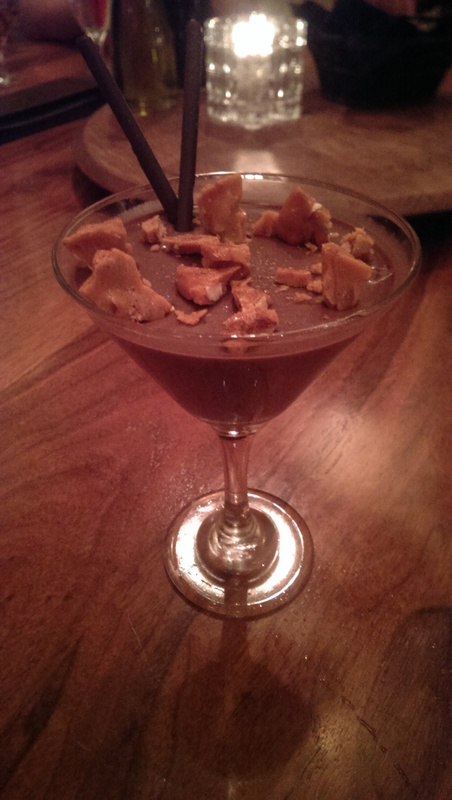 It tasted like a very rich hybrid mousse/pudding and had almond brittle scattered on the top with two dark chocolate straws. Yum. Jon had the tiramisu, which he let me taste, and it was good. I can never eat tiramisu without remembering our international college student from Italy whom we hosted last year along with our other international student, Bettina from Austria. One afternoon last spring, Georgio taught all of us how to make authentic tiramisu from scratch – as he’d learned from his grandmother. It was one of those amazing family memories I hope my kids hold onto. 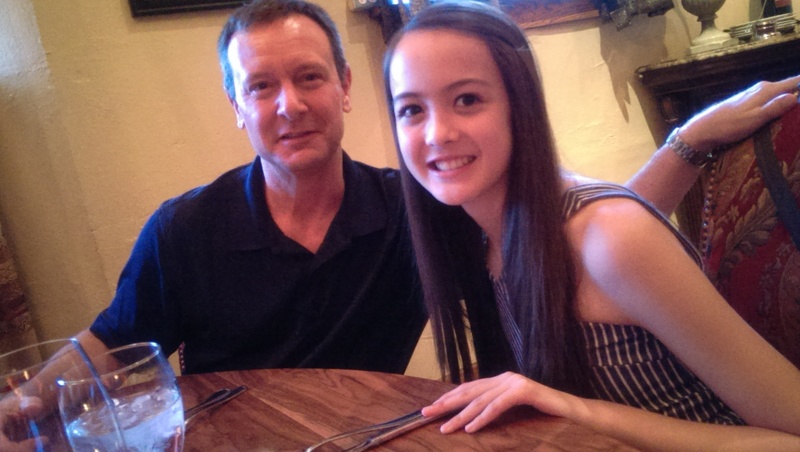 Kristin with her dad, Alan. Last night was definitely another wonderful family memory when many of us were able to gather together to celebrate the birthday of an incredible man – my dad.